Blackboard Help for Instructors. Also, see the main page for OWU Blackboard. Current instructors should select the first link to log into Blackboard Learn with your OWU credentials. There are students also registered in the course. Organizing courses in the Blackboard Ultra Navigation has changed from a module to a page in the menu. Here, courses that you teach or are enrolled in show up as course cards that show the course title, instructor(s), and course ID. To learn more about viewing your courses, visit the Blackboard Help page here. You have uploaded your syllabus, but students do not yet have access to the file. Before students can enter your course, you must make it available to them. To make your course Available:* Expand the “Customization” area of the course’s Control Panel. Choose “Yes” under “Set Availability” to designate your course as available to students. Scroll to the bottom of the screen and click “Submit” to save your changes. If you are teaching multiple courses, follow these steps to upload your syllabus and make your other courses available. If you’d like to use Blackboard Collaborate Ultra in your course(s), here’s what you’ll need to do. Go into the course where you’d like to use Collaborate. In the Course Management Control Panel, expand the Customization section. Click the Tool Availability link. Scroll down until you see “Blackboard Collaborate Ultra” in the list of tools. Click to put a check mark in the first box to the right, in the Available column. Click the Submit button at bottom right. Blackboard Collaborate Ultra will then show up in the Course Tools section of the Control Panel and the students’ “Other Tools” page. For help, see Blackboard’s Help site or Behind the Blackboard for best practices, documentation, and known issues. 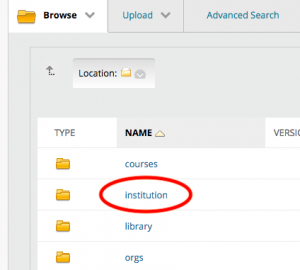 Click on the name of the course you want to upload your syllabus into. This will take you into your course. Be sure that the Edit Mode button in the upper right-hand corner is set to “ON.” You should see a course menu on the left-hand side of your screen. If you click through the menu buttons, you will notice that several of them contain no content. 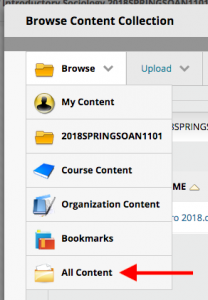 This section will walk you through uploading your syllabus, but first, you need to have your syllabus saved as a word or text document. Tip: Do not use spaces or special characters (e.g. #,+,*) for file names because some students may not be able to open the file depending on their computer settings. Only use letter, number and underscores. For example, use “english_comp_101.doc” instead of “English Comp-101.doc”. Never use an ampersand (&). Click the “Documents” link in the Course Menu. Hover over the “Build Content” button and click “Syllabus” in the drop down list. Under the Name section, enter the Syllabus Name into the text box provided. Under Syllabus, select Use Existing File. Click the “Browse My Computer” button to locate your syllabus (located on your computer). Once you have located the syllabus on your computer, click to highlight the file and then click the “Open” button. Scroll to the bottom of the screen and click “Submit” to save your changes to Blackboard. Congratulations! You have uploaded your syllabus to Blackboard. You can use these same steps to upload any file to Blackboard, including PDF files, PowerPoint presentations, pictures, or even short video clips. Select the course you want to modify. Open the Customization drop-down menu and select Properties. Under Select Language Pack, choose your Language Pack from the drop down list. This will be used for buttons, titles, and other text supplied by the system within that course. Optionally, put a check mark next to Enforce Language Pack. This will override individual student’s language choices. To customize the course navigation you will be adding to the course menu. You can add links on the Course Menu to items in the course. Items include: Content Areas that provide direct access to content items such as Learning Modules, Tests, and Lesson Plans; tools such as Email and My Grades; internal or external links; and elements that help organize the menu, like a divider. Here are instructions on how to do this. Click the Add icon (+) above the Course Menu. Select the item from the list. Type the Name of the content item in the Name field. Note: These steps are not recommended for combining classes or merging courses. See Merging Courses below. Select the course in which you wish to enroll the student. Under Control Panel, in the Users and Groups section, click Users. Hover over ‘Enroll User’ and click ‘Find Users to Enroll’. Add the username of the student in the Username field. (Our usernames are the first part of our OWU email address–what comes before the ‘@’ sign.) Alternatively, you can use the Browse option to search for students. You may enter more than one at a time by separating the usernames with commas. You may also use the ‘Batch Enroll Users’ button to the right of the ‘Find Users to Enroll’ button. To batch enroll users, create a text document or Excel file with the usernames of the users you want to enroll. See the Blackboard Help site for more information. Select a role; ‘Student’ is the default. Check ‘Yes’ on the Enrollment Availability to make sure your additional users can access your course. Faculty may also remove students from their courses by using the Remove Users from the Users page, by highlighting the selected users and clicking the ‘Remove Users From Course’ button. Note that when students log into their Blackboard accounts, they will only see the courses they are enrolled in and that are marked as available. If a course is not listed as it should be, contact the Blackboard Administrator. The Course Relationship Management feature automatically manages multiple sections of the same course. A system administrator will have to set one (or more) of your courses as child courses of a master course. Then, in the master course, you’ll be able to see which course students are actually enrolled in and our automatic enrollment integration won’t be affected. Just send a request to helpdesk@owu.edu and let us know which course you’d like to use as the master and which course(s) to link as child. It’s best if you haven’t created any content or had any interactions in the child course(s) before merging. First, you must be in the course you wish to copy content from. You must also be enrolled as Instructor in both courses. Under Control Panel, click on Packages and Utilities and select Course Copy. For Copy Type, select Copy Course Materials into an Existing Course. Type in the Destination Course ID under Select Copy Options or click the Browse button to find it. Now select specifically what you want to copy. You must have something selected under Select Course Materials. Click the Submit button. When the operation is successful, you will receive an email in your OWU inbox and a confirmation message will appear at the top of the destination course. Note: Please do not use this method to merge enrollments of multiple course sections. 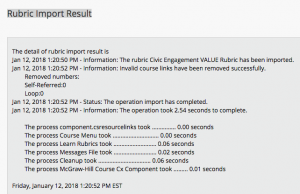 Information Services can merge courses using Course Relationship Management, which has some distinct advantages over manually copying enrollments. Simply send a request to helpdesk@owu.edu with the course IDs for the courses you’d like to merge, and which one you’d like to use as the master course. Instructors automatically enrolled in Blackboard courses are based on Registrar’s information. You may manually enroll additional instructors in your co-taught course by following the same steps for enrolling a student, above, (using the faculty’s username instead of a student’s) and setting the Role for them to Instructor (or Teaching Assistant or Course Builder.) Note that only a system administrator can remove Instructors from a course. To use the embedded mashup tool, you’ll need to switch to HTML editing view and replace all HTTP references with HTTPS. While editing, click the Toggle HTML Source Mode button, that looks like “< >”. You will see the HTML code. Press Ctrl+F on a PC or Command+F on a Mac to find the first instance of “HTTP” and add an S at the end. Repeat until they all have the S.
Save and close your the content item. The video should work embedded now in all browsers. Instead of embedding the YouTube video on the page and going through the steps above, add a URL content item and point it to the full YouTube.com page for the video. Set it to open in a new window to ensure that Blackboard opens the whole page. Click on the course that you would like to add an assignment for, make sure the edit mode (right side of the page below the red header) is turned on. You may create assignments in any content area, such as Readings Assignments found in the navigation menu, on the left side of the page under the course description. Once in a content area, three red buttons will appear in the yellow (gold) header in the middle of the page. Hover over the Create Assessment button and a drop down menu will appear. Then click Assignment on the drop down menu. On the Create Assignment page you must name the assignment and assign possible points. The assignment can either be typed out or you may upload it as a file. To upload a file go to section 2, labeled Assignment Files and click the Browse My Computer button to find the file you are looking for. You may adjust the due date, availability, and grading before the assignment is submitted. To submit the assignment and allow students access to it, click the submit button at the top or bottom of the page. For more information, see the Blackboard Help page on Creating and Editing Assignments. Create Questions and select the type of question you wish to create. Enter the question content, points, type of feedback, etc. When test design is complete, add the test to the course content by clicking “submit”. Finally select your test options. Under Membership select users you want to be added into your group. Finally select “Submit” to add your group. In your created group select “Group Blog” under the Group Tools. Enter your prompt and attach any documents you want. 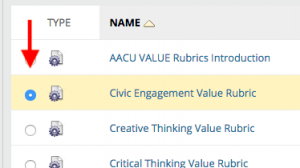 Here is how you can import the AACU VALUE Rubrics into your own courses, in 10 easy steps. These rubrics contain the AACU descriptions and scores in the Blackboard rubrics tool format. Thus they can be associated with assignments and used in grading submissions. While in your course, expand the course Tools section of the Control Panel, and click on the Rubrics. Click ” Import Rubric” in the menu bar. Click the Browse Course button. (This gets you access to more than just your course content, as you will see). In the Browse Content Collection window, hover over Browse, and select All Content at the bottom. Click on “Institution” in the Name list. 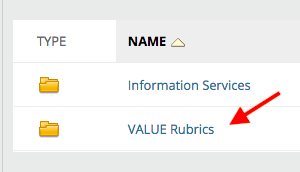 Click on “VALUE Rubrics” in the Name list. 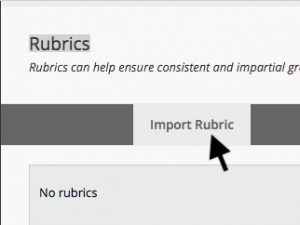 Click the circle next to the rubric you’d like to import. 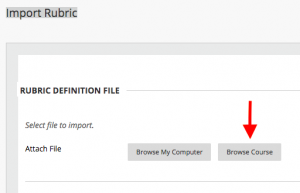 (If you click the name of a rubric at this point, it’ll download the zip file to your computer. You might want to do that for the AACU VALUE Rubrics Introduction, as it’s a PDF, and won’t import as a rubric). Click the Submit button in the lower right in the Browse Content Collection window. Then click the Submit button in the lower right on the Import Rubric screen. It’ll take 5-10 seconds for it to import, (and it might look like Blackboard isn’t doing anything. Practice patience, as needed). You’ll see a Rubric Import Result screen, confirming the import. Click OK at bottom right. 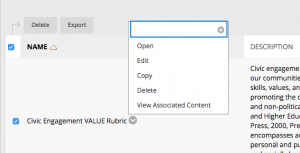 The imported rubric will then appear in your Rubrics list. Click on the action button that appears when you hover over it, select Open to view it or Edit to revise it. Once the rubric is in your course, assignments can be associated with it. Instructions and videos on how to do that can be found on Blackboards Help site. In the course Control Panel, expand Customization. Scroll down to SafeAssign and put a check mark in the first box (Available). Click the Submit button at the top or bottom of the screen. In SafeAssign, the overall score is an indicator of what percentage of the submitted paper matches existing sources. This score is a warning indicator only and papers should be reviewed to see if the matches are properly attributed. Scores below 15 percent: These papers typical include some quotes and few common phrases or blocks of text that match other documents. These papers typically do not require further analysis, as there is no evidence of the possibility of plagiarism in these papers. Scores between 15 and 40 percent: These papers include extensive quoted or paraphrased material or they may include plagiarism. These papers should be reviewed to determine if the matching content is properly attributed. Tips for Grading in the Blackboard Ultra Navigation can be found on their Help site. 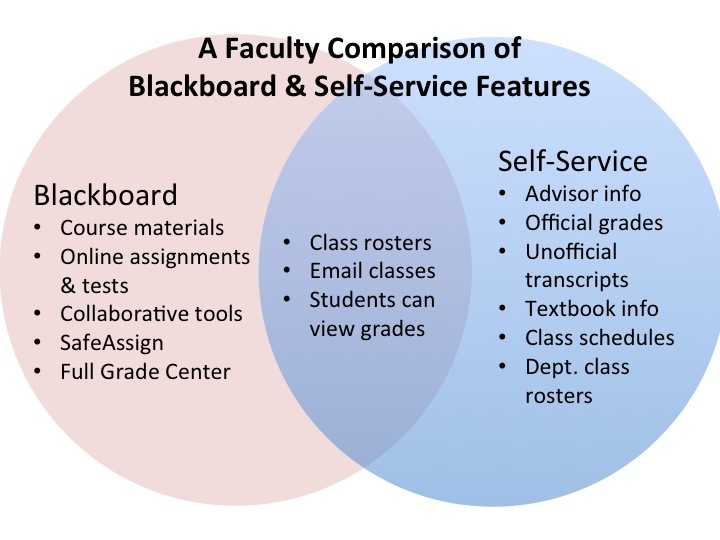 Information Services Professional Development offers a Blackboard course for faculty and staff. This online Blackboard course is offered in an effort to enhance and augment in-person training opportunities. Here you’ll find training videos and links to additional resources, as well as surveys and discussion forums on workshop topics. It’s an example of blended learning, combining face-to-face (F2F) with online activity, sometimes referred to as hybrid teaching or ‘flipping’ the classroom. Go into the course and into the area where you posted the test for the students to find it. Hover your mouse pointer over the test item and click the action button that appears. Select ‘Edit the Test Options’ from the pop-up menu. Scroll down to the TEST AVAILABILITY EXCEPTIONS section, and click the ‘Add User or Group’ button. Select the excepted users in the list of enrolled students and click the Submit button at the bottom. Make sure the number of Attempts shown for this excepted student is what you want. Click the calendar button under Availability, and set the availability of the test for him. Click the Save button in the pop-up window., then click the Submit button at top or bottom of the Test Options. Note: Using Test Availability Exceptions in Blackboard (Test Options) hides the “Availability: Item is not available. It will be available after…” in the content area because it now has more than one availability setting. If you turn Edit Mode off, the test will disappear if it is outside the default availability timeframe. While Information Services has archived copies of historic courses that may be restored on request, you may create a personal archive copy of your course at any time. Go to your Course Control Panel > Packages and Utilities > Export/Archive Course. Select the option of your choice. “Export Course” creates a package of course content that can later be imported into the same course or a different course. “Archive Course” creates a permanent record of a course including all the content and user interactions available at the time the Archive is created. Select copy options and file attachment settings, and click the Submit button. You may calculate the package size before you do, and manage the package contents. Blackboard Ultra is designed to be fairly simple to use, and information as well as help is placed at convenient locations while you are using it. Workshops on Blackboard are offered two or three times an academic year. An announcement about upcoming workshops is sent to all faculty members. The current workshop schedule is posted on the Information Services web site. If you have additional questions, contact the Blackboard Administrator. Contacting the primary Blackboard Administrator David Soliday 740-368-3130 dcsolida@owu.edu You may also contact the Help Desk for Blackboard requests and issues.